Press Release: BlackBerry 4G PlayBook Coming to the Sprint 4G Network this summer! It's looking like CES 2011 is definitely all about the BlackBerry PlayBook. Following up on our BlackBerry PlayBook review coverage, Sprint and RIM have officially announced that the BlackBerry 4G PlayBook will be available from Sprint this summer. I'm sure a lot of BlackBerry fans on Sprint will be excited for this one. The press release is below for full details. January 6, 2011 - CES 2011, Las Vegas, NV - Research In Motion (RIM) (NASDAQ: RIMM; TSX: RIM) and Sprint (NYSE: S) today announced plans to launch a new BlackBerry PlayBook tablet model featuring connectivity to the blazingly fast Sprint 4G network. The BlackBerry 4G PlayBook will be the first BlackBerry PlayBook model to include wide area wireless connectivity, featuring Sprint 4G to give customers download speeds up to 10 times faster than 3G1. This new 4G model is expected to be available from Sprint in the summer. "We are excited to bring this powerful new product to our business customers and consumers who rely on Sprint for industry-leading devices as well as one of the best values in wireless," said Steve Elfman, president of network operations and wholesale for Sprint. "This tablet is a great example of Sprint's strong partnership with RIM in continuing to bring customers powerful devices to enhance their mobility. 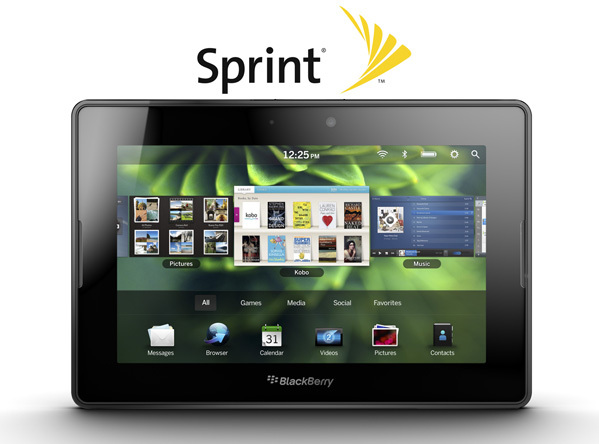 We are confident the BlackBerry 4G Playbook from Sprint will be one of the most anticipated tablets in 2011."